Hypertension in Pregnancy: Problem for Life? 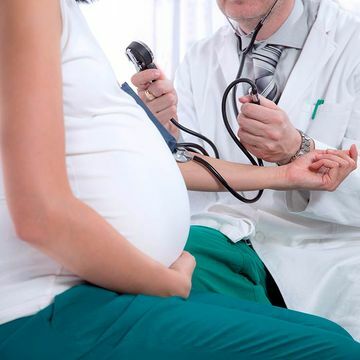 Could high blood pressure in pregnancy lead to cardiovascular disease later? A study says yes—not just for you, but for your siblings, too. But can you prevent it? We already know that high blood pressure when you're pregnant has risks for both mom and baby—that's why your doctor checks it at every prenatal appointment. But a new study in the Journal of the American Society of Nephrology finds that women who have hypertension in pregnancy—and, more shockingly perhaps, their siblings—are at risk for cardiovascular disease later in life as well. Scientists looked at over 2,000 women and men from almost 1,000 sibling relationships in a study of the genetics of high blood pressure, also called hypertension. "Compared with their sisters who had normal blood pressures during pregnancy, women who had hypertension in pregnancy were 75 percent more likely to develop hypertension later in life," lead researchers Tracey Weissgerber, Ph.D., and Vesna Garovic, M.D., of the Mayo Clinic told Fit Pregnancy in a joint email. In addition, they found that siblings of pregnant women who had high blood pressure were also at increased risk of hypertension later on; and brothers, but not sisters, were at increased risk of heart disease. Because siblings had increased risk of later high blood pressure, it appears that genetics plays a part in the cause—but, hypertension in pregnancy might actually create long term damage in the body as well. "Our study suggests that familial factors do contribute to future hypertension. However, women who had high blood pressure in pregnancy were still more likely to develop high blood pressure later in life than their sisters who had normal blood pressure in pregnancy," Weissgerber and Garovic say. "It is definitely possible that both familial factors and lasting damage to the heart and blood vessels caused by the hypertensive pregnancy could contribute to hypertension later in life." The cause is further complicated, though, because the sibling connection may involve other factors besides genetics. "Brothers and sisters are often similar in other ways," the doctors say. "For example, they may have similar diet and exercise habits, which can also affect disease risk." Further studies are needed, they say, to figure out the exact reasons for the link. But whatever the cause, is there anything you can do to prevent high blood pressure when you're pregnant, therefore lowering your risk later on? "Being physically active, eating a healthy diet and maintaining a healthy weight can help to prevent health problems such as hypertension, obesity, and diabetes prior to pregnancy. These conditions all increase the risk of hypertension in pregnancy," Weissgerber and Garovic advise. In addition, "attending regular prenatal visits is very important. Your doctor will check your blood pressure during these visits, can provide guidance on healthy weight gain during pregnancy, and can act quickly if your blood pressure starts to rise." If you've already had high blood pressure during pregnancy, there are steps you can take to prevent it reoccurring later on. "Postpartum care is very important for women who experience hypertension in pregnancy," the doctors say. "Women should make sure that their high blood pressure returns to normal after delivery, and then have regular follow-up visits to monitor it. Early detection and treatment of high blood pressure is important for preventing stroke and heart disease." If you're planning another pregnancy, talk to your doctor about your risk of developing it again. As for your siblings (or if your sister had high blood pressure in pregnancy), being aware of the family history is important as well. "Maintaining a healthy lifestyle can help you to prevent hypertension," Weissgerber and Garovic say. "This includes eating a healthy diet, getting regular exercise, reducing sitting time and maintaining a healthy body weight."